A few years ago, food manufacturers figured consumers wanted healthier cereal options. They started upping the protein content, reducing sugar, using whole grains, etc. But according to the Wall Street Journal, Americans just want marshmallows and sugar, thanks. General Mills and Kellogg Co. have both reverted back to sugary offerings with new Lucky Charms Frosted Flakes and Chocolate Frosted Flakes, realizing that consumers really don’t care about granola and freeze-dried berries and fiber. People who want a healthy breakfast, it turns out, are more apt to chose yogurt or fruit over cereal anyway. 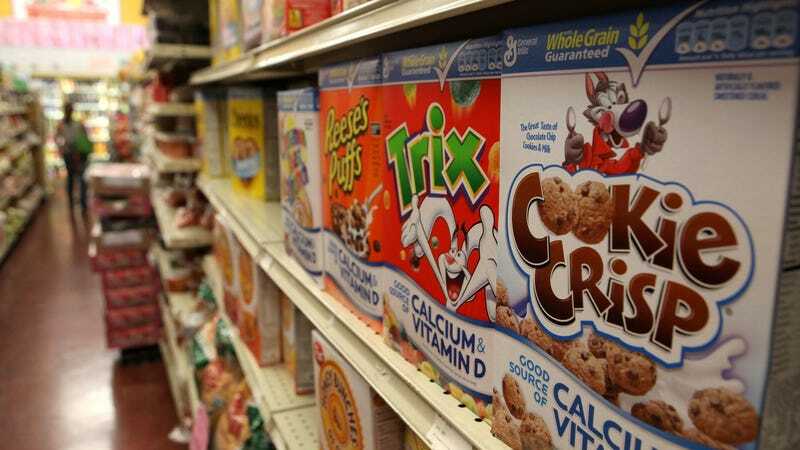 Consequently, cereal sales have dipped 11 percent in the past five years, according to Mintel data reported by the WSJ. John Owen, an analyst at Mintel, tells the WSJ that adults consider cereal “a permissible indulgence,” a late-night treat rather than a vitamin-packed breakfast choice. Cereal makers are hearing the message: Just give us a box full of cookies, dammit, and pretend it’s cereal. Bonus points if there are marshmallows shaped like unicorns and some form of chocolate in the mix. Has anyone manufactured Peeps cereal yet? Free million-dollar idea. With recent cereal-aisle shakeups like Post’s replacement of Morning Energy Honey Bunches of Oats with Oreo Os, and Kellogg swapping low-sugar Frosted Flakes for cinnamon and chocolate flavors, companies are putting sugar back on the breakfast table. Buddy The Elf would approve.